Lake Calenhad stretched out before them. The largest inland water body in Ferelden – probably in all of Thedas – was dark and turbulent here, its waters murkily lapping against the shores on one side, and against the island that housed the still-imposing Circle Tower on the other. 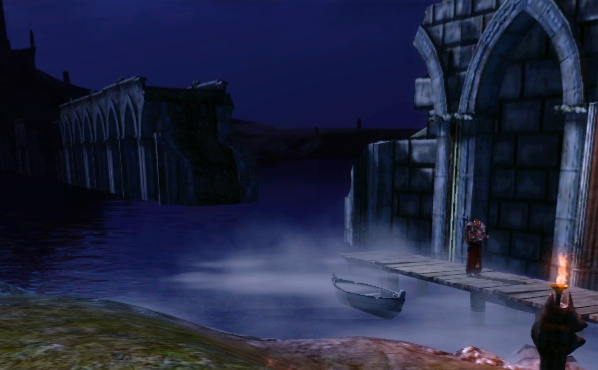 There had once been a road connecting the mainland to the Tower, a bridge built by the Tevinter Imperium when it had ruled over Ferelden. It had long since fallen into disrepair. A small jetty and the little ferry-boat it housed was now the only way to get to the Tower. A village had sprung up around it, little more than a few scattered houses and the big tavern, The Spoiled Princess, which was always full of people either having business at the Circle Tower or stopping over on the way from Redcliffe to Denerim. The plan was to hire a room for Leliana at the Princess and for Neria to go alone to fetch help from the Tower. It would be faster and more effective than announcing themselves as Wardens, she had pointed out, and the ferry boat that went across the lake could never carry an injured Leliana in any sort of comfort. Neria had spent exactly one night in the Princess. It had been when the Templars had brought her to the Circle as a child. They had arrived well after darkness had fallen, and she had been put to stay in a room in the Tavern with one of the Templars watching her at all times, as had been the case all through the journey. She had missed her mother terribly. She remembered crying herself to sleep thinking about her. As Neria looked at the Tavern, she wondered when she had forgotten her mother. She barely remembered what she looked like now. She had had golden hair like herself, Neria remembered that, and was beautiful too, but not so dark as Neria was. She wondered if her mother was still in Denerim, at the alienage. Had she found companionship again? Employment? Children? Maybe she had another family now, and had forgotten the daughter who had gone to the Circle all those years ago, just as the daughter had forgotten having a mother. “Who was your mother, Alistair?” she asked, as they walked from Bodahn's wagon towards the Tavern. He seemed surprised at the sudden question. Neria scratched her nose thoughtfully. “Do you fancy Leliana?” she asked. Alistair stopped and turned to look her in the face. He could make out Morrigan and Sten directing a servant who had come down from the Spoiled Princess with a stretcher to carry out Leliana from where she had been sleeping inside the trade wagon. Biscuit was marking his territory on a wooden post that showed the way to the dock. 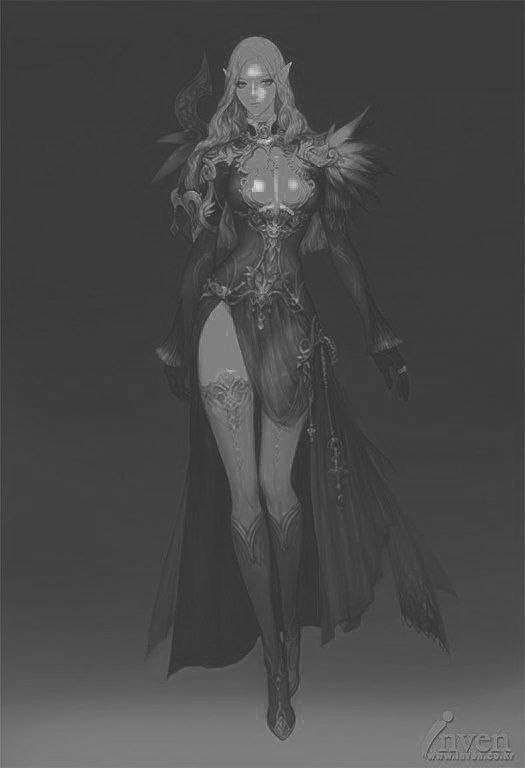 And then there was Neria, smooth, bare dark skin, shoulders, torso, stomach, legs, all that perfection, the flimsy robe covering only the barest minimum, bright blue eyes, dirty blonde hair pulled tightly back into a ponytail, a few strands falling over her forehead nonetheless, asking him if he liked Leliana? Of course he liked Leliana, who did not? She was pretty, she was adorable, she had an amazing figure and she was devout – the girl you wanted to take home and kiss and admire. But she was not Neria. Neria with the nonchalant disregard for convention, Neria who seemed to live and breathe desire, Neria whose fire was unquenchable, Neria who disgusted and inflamed him in equal measure. “Yes, I mean, I hardly know her, but she seems a nice sort,” he said, trying to put it outside his mind. “What about Morrigan?” They were walking again now, towards the tavern. “Do you think she actually likes anyone?” wondered Neria. “That's unfair, Alistair!” she exclaimed, with a vehemence that surprised him. She strode off towards the pier, leaving him standing in place. He remained there until Morrigan came and asked acerbically if he was trying to look like a statue of King Cailan. “And Loghain has declared the Wardens traitors to the Crown and ordered a bounty on their heads,” said the old man sitting next to the bar table, sharing the latest gossip with the customers. Alistair chuckled as he recalled the clumsy amateurs who had, indeed, tried to collect the 'bounty'. Even without Leliana, he and the rest had made short work of them. Morrigan, who was feeding Biscuit scraps of bacon near the fireplace and trying to look very hard as if she was not enjoying it, had transformed into a very scary-looking Wolf. 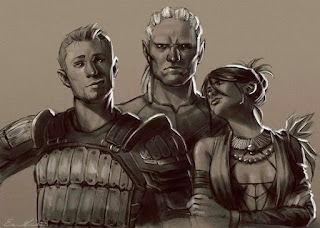 It had been more for the shock effect than anything else, but worked beautifully, with Alistair and Biscuit embarking on a slaughter while Neria picked off the injured bounty-hunters with arcane bolts. The old man had spoken, and now setting aside his audience, he walked over to where they sat, Morrigan and Alistair facing each other with a mug of ale in their hands, Biscuit between them. Sten sat at a table a little distance away with Bodahn and his son, who was watching the bubbles in the ale his father was drinking, quite fascinated. “I'm sorry, you might have mis-heard,” said Alistair, cursing himself for speaking out loud. The last thing he wanted was a situation like Lothering where the peasants of the village tried to collect the bounty and got themselves slaughtered for it. “Sounds like her,” Alistair admitted. The man was white-haired and had a slight paunch and did not look armed. It was more than likely that he would have heard about Neria if he had lived in the village. No doubt stories carried across the water. “Is she here? I wonder if she remembers old Kester. Good times we had, her and old Kester,” he chuckled. “Don't tell me,” Alistair sighed. Clearly Neria's standards were even lower than he had suspected. Alistair was not sure what to think of that particular answer. “And the other half?” asked Morrigan with a grin. “On them fine knees, of course. That mouth of hers is mighty sinful, I’m told,” Kester gave a roguish wink. Morrigan and Alistair looked at each other in alarm. “I heard the man speak,” said Sten, who was already fastening his great-sword on his back. Biscuit followed, his tail still and eyes wary. The pier looked much the same as she remembered. The little boat did too, and the Tower across the water was as ominous as it had appeared when she had first seen it as a eight year-old child. Apart from a man in Templar armour at the end of it, she couldn't see anyone there. There was no sign of Kester the ferryman. Neria impatiently walked towards the Templar. He was a ferret-faced young fellow with carrot-coloured hair. “Kester should be hanging around near the Spoiled Princess,” said the Templar, keenly observing his nails. Neria stamped her foot angrily. That made him raise his head and look at her. And gasp. “Name's Caroll. Recognised you from the likeness in Cullen's locket. Arrived from Denerim last month,” he chuckled softly, as if he had just said something very funny. “Well, I need to get across, Carroll,” she snapped. “No! I've one job, and one job only, and by the Maker's shiny gold cutlery, I will do it!” Carroll responded, just as vehemently. Neria took a deep breath and spoke slowly. She had seen Templars suffering from lyrium poisoning and could identify the symptoms. He dropped his voice to a conspiratorial whisper. “Is there a problem at the Tower?” asked Neria. “The Tower is the problem,” said Carroll with a buffoon-like grin. “Wynne came back from Ostagar,” Carroll grinned, rocking back and forth on his feet. For a moment Neria contemplated setting Biscuit on the Templar and finding Kester and getting him to take her across. But she wouldn't make any friends going to the Tower with a dead or injured Carroll left behind. She fished the Treaty out of the bag slung around her back. Carroll took a long hard look at it. Apparently he found this a very amusing joke, because he chuckled again. Finding nothing in the names he called her that she could plausibly deny, Neria stuck to being persuasive. “You're too eager to get across. What do you mean to do, evil demon of desire and tailoring?” his eyes narrowed. Sten had his sword in hand as well. Biscuit bared his teeth in an angry grin. But Neria remained unmoved, her staff still slung across her back. “Hah! I can swim!” said Caroll triumphantly. “Maybe you should look into the water,” said Neria. Caroll slid his eyes right without moving his head. The water underneath them was frothing. Bubbles rose to the surface. He swallowed nervously as the steam rose from the surface. “The whole lake?” he asked, a reverential note entering his voice. Biscuit hung his tongue out of his mouth. Caroll sheathed his sword and began to pull the rope, bringing the ferry-boat close to the pier. Neria stepped into the boat. Biscuit jumped into the boat as well. “Full house,” grumbled Caroll, picking up an oar. “Full boat,” said Neria thoughtfully. The gates to the Circle Tower were massive, iron-lined wood, older than the Tevinter Imperium. As Alistair entered, Biscuit at his side, he had a definitive sense of being very small. He had expected to enter into a passage or a Hall. Instead he seemed to have wandered into an infirmary. Men – mostly Templars, lay wounded or dying on the floors, as other men tended to their wounds. There was a smell of ointment and healing potions heavy in the air. A few Templars stood, silent and helmed, their faces invisible. At the other end of the passage were massive wooden gates just as large as the one he had come through, shut and barred with massive iron latches. He felt their eyes upon him as another man approached, wearing the Templar armour with the tree symbol on the chest-piece, grey haired and bearded. “My respects to you, Knight Commander Gregoir,” said Alistair, bowing. He had seen him once at Redcliffe. It was the visit when he had met young Cullen as well and they had sat in the Tavern talking about the Chant of Light and a beautiful little Elf girl who made Cullen struggle so much with his vows of celibacy. “Who? What's this, who are you? Did I not specifically tell Caroll not to…Seldon, go see what the idiot is up to. Or, just…oh, forget it.” Gregoir seemed to bark rather than speak. The old Templar cast a piercing gaze at Alistair. Alistair was about to open his mouth to defend himself, when Gregoir raised a hand. “Yes, that would be me,” admitted Alistair. “Is something wrong?” asked Alistair. “And the mages?” Alistair's jaw dropped. Alistair shuddered where he stood. The Rite of Annulment was effectively a death sentence to every living mage in the Circle. It was the most powerful weapon in the hands of the Templars and only invoked in the most extreme circumstances. If Gregoir had already asked for it, the situation inside must have been dire indeed. Alistair shook his head wordlessly. So this was it. No Wynne, no magical healing, no life for Leliana and no help from the Circle of Magi in fighting the darkspawn. In a day or two, or however long it took for the missive to reach from Denerim to Lake Calenhad, there wouldn't BE a Circle of Magi in Ferelden. He turned to leave. “Yes,” said Alistair, turning and speaking cautiously. 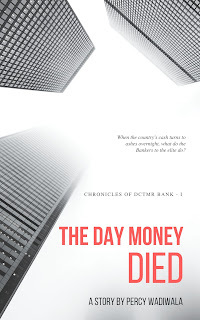 Neria was walking – sashaying in, rather, hips swaying, running a finger around her lips. Mercifully she had not taken pity on Caroll and decided to let him have her, or else Alistair felt they would have a tough time explaining any visible marks of their activity. “You!” Gregoir spat out the word as if it was a curse. Her presence had certainly caused a sensation around the room. Bleeding, injured Templars were staring at her, transfixed. Clearly this was an audience she had under her thumb. “What's going on here?” she asked, her voice just as assertive as Gregoir's in its own way. “I've lost over fifty men in there,” said Gregoir, gnashing his teeth. Gregoir hesitated. Alistair thought he could guess what the old Templar was thinking. He was not sure of the allegiance of his men, most of whom had surely partaken of the pleasures Neria could give, apart from the undeniable fact that as a righteous man, Gregoir could not ignore the fact that there was a Blight in Ferelden and the Wardens were the only chance Ferelden had of ending it. If she went inside the Tower, at least her fate would be taken out of his hands. As the gate to the inner corridor of the Tower creaked open, Alistair leaned in and whispered to her. “If we walk away, we sign Leliana's death warrant. 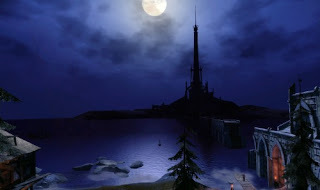 Besides, the Tower was my home, and I mean to save it if I can. You know, I've always fancied confronting a desire demon,” she replied with a nervous laugh. The voice that spoke was behind them. Two Templars there, inside the closing gates. The one who had spoken was a handsome man with long black hair. It was the other one who answered, an older man with curly red hair. She touched the man's cheek. The look in her eyes - an amalgam of lust, gratitude and pride, made Alistair shake his head with wonder at the contradiction that she represented, a mix of nobility and goodness and wantonness that he just could not reconcile in his mind. “The rewards will be great, Deveron, and the pleasure will be mine as much as yours,” she promised, her eyes moving down to the magnificent body that the Holy Sisters so proudly displayed, and then locking with his again – all that was needed to make him, and the others imagine what she meant. “Good to have back-up,” agreed Alistair. “What's the threat of demonic possession before the attractions you have on display?” winked Ser Brodriger.